The prevalent message when it comes to wealth building or savings have always been: Pay yourself first, set aside X% of your income before you spend. In Singapore, it is how this CPF system works as well. Mandatory savings. Its easy to proliferate the message because its straight forward. I chance upon a financial planning article from Michael Kitces that would make good reading for readers interested in this subject, whether you are fine tuning your wealth building or helping friends. The idea is interesting. And one linkage that have escaped me and perhaps some of you. You essentially have Wealth Building be a part of a particular slice of your income. Do that before spending on anything else. The problem here is that this Wealth Building is a fixed percentage that usually is Smaller than the proportion of your spending. What happens is your spending always outpace in your savings. Lifestyle is also ramping up proportionally. Assuming you need to spend 25 years, your much higher annual spending is too much for what wealth you build up. We can model this with my Wealthy Calculator which is FREE for everyone to plan how to grow their wealth and spending. For a 25 year old, starting with $35000 in gross annual earnings and $28,000 in disposable income growing at 3% per annum, having a 40 year wealth building horizon, channelling a uniform 10% of his disposable income to building wealth at 5% rate of return. His eventual spending will be too big such that, he requires to take more risk in wealth building. Too high of a spending. What is proposed is not to channel a uniform % to wealth building (!!!) but channel 50% of any raises in the future to wealth building. As you earn more pay raises, your contribution rises. The upside of this is that you are controlling your rising standard of living, focusing on not being too indulging and lifestyle creep. 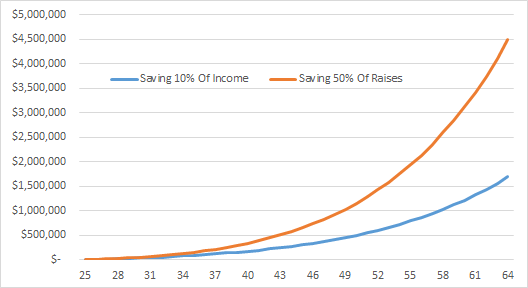 The crazy maths of this is that your savings rate actually end up much higher. There are some things that if you don’t say out, you probably won’t know the pronounced difference. 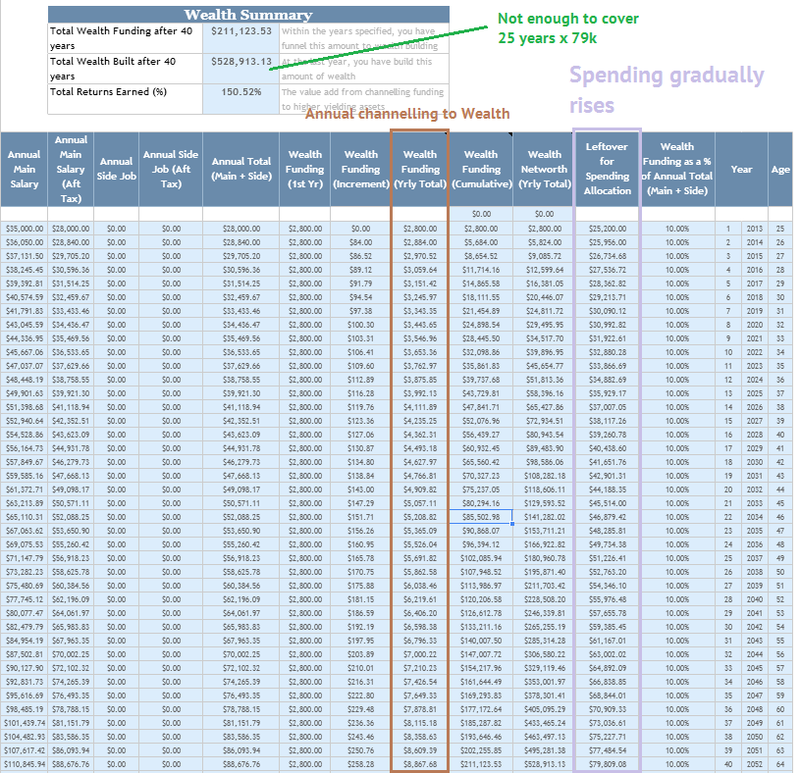 Instead of a consistent 10% channelling to wealth, you can see the % slowly rose from 0% to 34% where in the 9th year it starts overtaking the 10% hurdle.In the last year the channelling to wealth building was $30k vs the previous $9k and the final spending is $20k less. 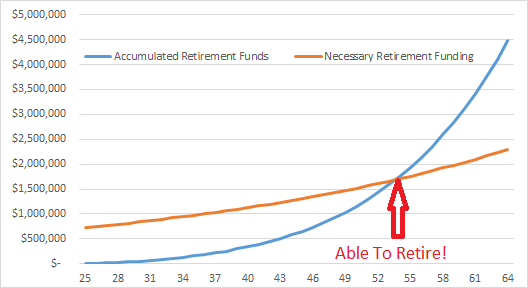 Much more manageable but STILL does not meet what is required for retirement. The upside of only spending 50% of your pay raises is that psychologically its easier to accept. Successful Wealth Building depends a lot on these systems and habits to make it stick. The unique factor here is that pay raises are future money that you have not seen yet. And commitment to save this future money that you are not using now makes it easier psychologically to accept. The best part is that you do not need to give up on current lifestyle. With life getting harder, working within this current lifestyle box and keeping a reign on lifestyle creep looks a better proposition. Focusing the narrative on spending instead of wealth building is also productive in that you are giving you permission to spend. Read more about saving your increment here. Further upside of this is that it allows the young worker to focus his starting pay on improvement where studies have shown is a better idea than starting a retirement plan. It also makes sense to focus on making your career more productive to work for pay raises. The caveat here is that perhaps the comparison is done between a 10% uniform wealth building versus a 50% pay raise wealth building rate. 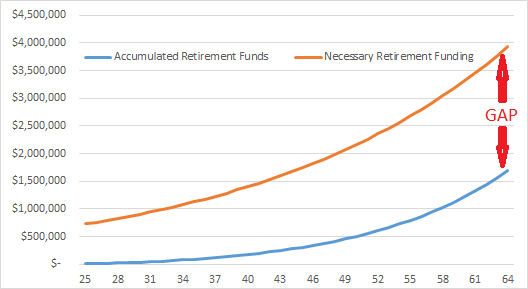 Kitces is quick to recognise that 20% you can probably hit the retirement spending needs. The benefit of a larger uniform channel is that, time value of money and power of compounding concepts mean that channelling more money early to build wealth is better. 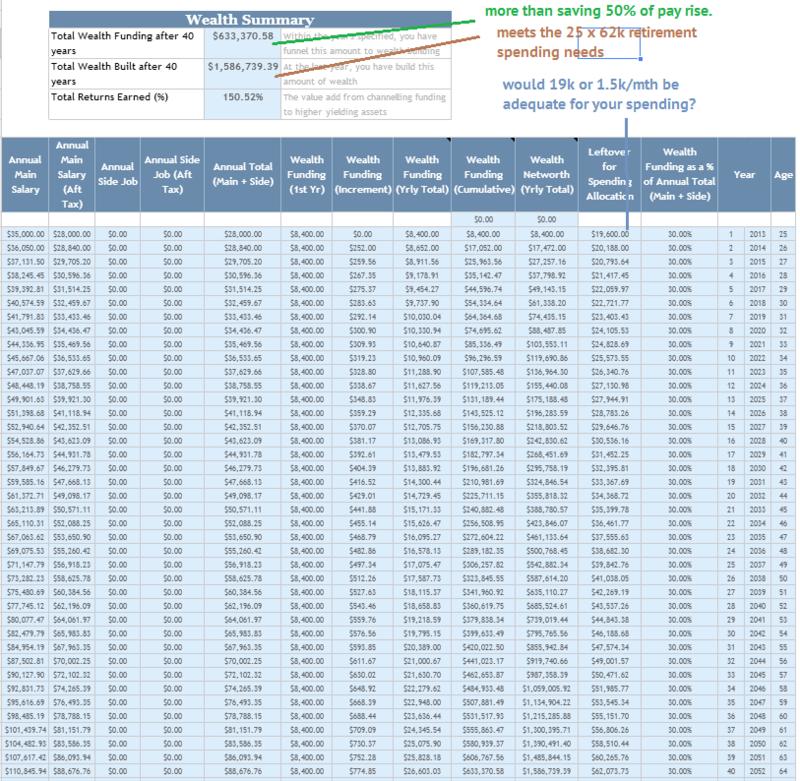 If you jack up the uniform wealth building rate like some crazy bloggers or folks, then you are going to equal or outpace the saving 50% of pay raise methods. Again, your rate of pay raises will matter a lot as well, and the amount you channel. In the above illustration, every thing is the same, only this time instead of a 10% uniform channelling or a 0%-50% channelling, its a uniform 30% channelling. The final yearly channelling to wealth is less than saving 50% of your pay rise, but this, as well as final spending ($62k vs $59k) matches that of saving a high pay rise. 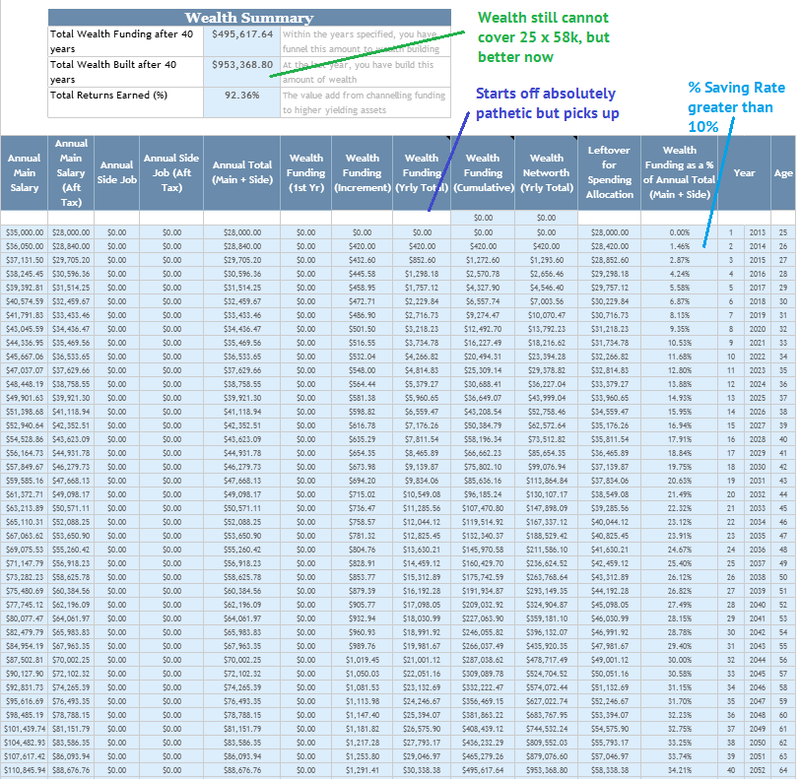 The final amount of wealth build is much higher at 1.5 mil, at the same growth rate of 5%. The difference here is that you are channelling more to Wealth building and , as stated, time value of money and power of compounding is a potent combination. The caveat here is whether $19k or $1.5k per month is a window you can work with for initial spending. Make it too tight and it might just kill the person’s interest to prolong this. This article is a perfect opportunity for folks to play around with the Wealthy Calculator to get a better understanding of things and perhaps a comfortable level to work with. My take away is that this article is more as a general rule of thumb, or more as a general message. If we are talking about a responsible individual, even a uniform savings rate would not mean lifestyle creep. This is more for how an organization, country can redesign their system around the psychological tendency of its people to ensure that they are less of a government liability in the future. If you enjoy this article do share it and do subscribe for regular Wealth Building, Personal Finance Articles. Good idea but ultimately when it comes to implemention, not much different from saving a percentage of pay, whether it be monthly timed transfers to a spending account (leaving savings in saving account) or savings to a savings account. It’s extremely different in how it compounds over time, as illustrated in the charts and documents.